At the first working conference on the linguistic and ethnographic papers of John P. Harrington, held in Santa Barbara in June 1992, plans were made for further meetings and projects, as well as for maintaining and expanding the network of Harrington scholars. 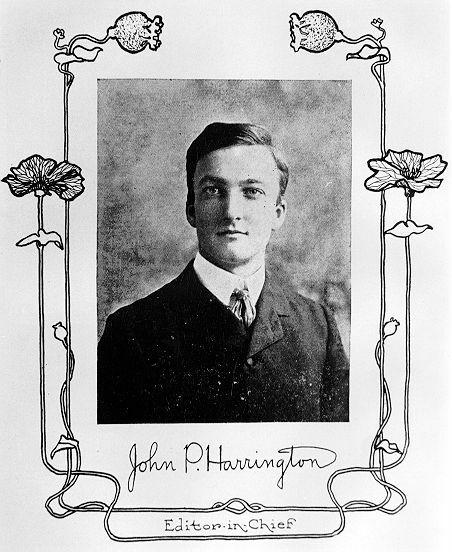 The Newsletter of the J. P. Harrington Conference serves as the vehicle for communicating information about these and other Harrington-related activities. The Newsletter is published at irregular intervals and is distributed free to anyone interested. To be placed on the mailing list contact the editor: Victor Golla, Dept. of Ethnic Studies, Humboldt State University, Arcata, CA 95521. Telephone: (707) 826-4324 or 677-3361. Fax: (707) 826-4418. E-mail: gollav@axe.humboldt.edu or vkgolla@ucdavis.edu. The 1996 Workshop on Hokan and Penutian Languages will be held on Friday June 28 & Saturday June 29, 1996, in the Alumni House (Toll Room) on the UC-Berkeley campus. It will be immediately followed-in the same location-by the 1996 Working Conference on the Papers of J. P. Harrington, on Saturday June 29 & Sunday, June 30. This joint meeting is being co-hosted by the Department of Linguistics at UC-Berkeley and the Department of Native American Studies at UC-Davis. The Friday sessions will be entirely devoted to Hokan-Penutian papers. The Sunday sessions will be devoted to presentations on the Harrington materials. The Saturday sessions will be divided between the two topics according to the number and nature of the abstracts received. Papers intended for the J. P. Harrington Conference-please mail or e-mail a title and brief abstract of your paper to: Victor Golla, Visiting Professor, Dept. of Anthropology, UC-Davis, Davis, CA 95616 (vkgolla@ucdavis.edu). Papers intended for the Hokan/Penutian Workshop-please mail or e-mail a title and brief abstract of your paper to: Leanne Hinton, Dept. of Linguistics, UC-Berkeley, Berkeley, CA 94720-2650 (hinton@violet.berkeley.edu). It would be appreciated if your abstracts reached the organizers before Friday, May 31, 1996. As most readers of the JPH Conference Newsletter know, the microfilm edition of The Papers of John Peabody Harrington in the Smithsonian Institution, 1907-1957 was an undertaking of Kraus International Publishers, who until now have also been the distributors of the film. Late last year, however, Kraus announced the termination of its scholarly microfilm division. The distribution rights to the JPH microfilm have now been transferred to: Norman Ross Publications, 330 West 58th Street, New York, NY 10019 (tel: 212/765-8200; fax: 212/765-2393). We are happy to report that the Norman Ross company is continuing to market the Harrington microfilm, as well as the Guides to the material prepared by Elaine Mills, and that the employees we dealt with on the phone recently were knowledgeable and helpful. Although they welcome inquiries from libraries and institutions interested in purchasing substantial portions of the 500-reel collection, they are making an effort to serve the needs of individual researchers as well. The microfilm is available for purchase at $90 for a single reel, or $70 per reel for orders of two or more. They will sell individual copies of the Guides when they have a sufficient stock, and where they are down to their last few copies they will xerox the relevant pages for you. Speaking of JPH's aluminum disc recordings - Jack Marr recently sent us an article clipped from the Orange County Register for Sunday, January 17, 1996, which described the monthly "language lessons" that are being held by members of the Juaneño Band of Mission Indians at San Juan Capistrano. Rather than the usual vocabulary drills and tutoring in a practical orthography, the Juaneños gather to listen to tape recordings of the last fluent speaker of their language, Anastacia Majel, dubbed from aluminum discs that Harrington and his nephew, Arthur, made in the mid-1930s. Tribal researchers were led to these recordings about three years ago, and have found them and the associated notes to be a cultural treasure trove. "Anastacia's our savior," Joyce Perry is quoted as exclaiming. (Joyce, one of the leaders of the Juaneño language revival, helped organize the very successful 1994 JPH Conference at Capistrano). "Imagine what it felt like when we found these. We freaked! For me, this is like living through my ancestors' dreams. To be able to use their words and pass them on to my children." According to the article, a photograph of Majel (who died in 1938, shortly after JPH and Arthur worked with her) is set in front of the room during the class, so that there will be a face to go with the voice. "When I look at that picture and hear her speak, it's like she comes alive," Bud Sepulveda, one of the 20 or so Juaneños who regularly attend the sessions, is quoted as saying. Among the other students are two of Majel's grandsons, and a great-grandson. Arthur Harrington told the Register that Majel had a fondness for his eccentric uncle. "When he went into things like this, he went in wholeheartedly, and she was grateful for that." Altogether, 145 hours of recordings were made, over the course of two months. The sound quality is generally quite good. Linda Agren, "The Exploration of Burton's Mound: John P. Harrington, Santa Barbara, 1923"; Chad Tritt, "The San Diego State University Burton Mound Collection"; David Earle, "Field Research among Takic-Speaking Groups during the Early 20th Century: Evaluating Harrington's Fieldwork within a Wider Ethnographic Context"; Brian Haley & Larry R. Wilcoxon, "The Implications of Revision: Point Conception's Sacredness Revisited"; Ken Hedges & Ken Gary, "The Harrington Mojave Collection at the San Diego Museum of Man"; John R. Johnson, "Chumash Political Succession as Reconstructed from Harrington's Ethnographic Papers and Mission Records"; Bruce Love, "Luiseño Placenames, Harrington's Notes from Pechanga and Pala, and Archaeology"; Cindy Stankowski, "Baskets Full: The SDSU-John Peabody Harrington Native American Basket Collection"; and Susan Wolfe, "Going Places in the Southern San Joaquin Valley with J. P. Harrington"
For further information contact Lynne Christenson, Dept. of Anthropology, San Diego State University, San Diego, CA 92182-0377 (lchriste@mail.sdsu.edu). My paper on "Ritual and Therapeutic use of 'Hallucinogenic' Harvester Ants (Pogonomyrmex) in South-Central California" should be appearing in the Journal of Ethnobotany in June 1996. As I mentioned in an earlier note, there's quite a bit of Harrington material in this-mostly Kitanemuk, Chumash, and some Yokuts. I have been going over the catalog of photos from the Harrington collection and note that for the pictures taken on St. Paul Island (in the Aleutians) in 1941 the name "John Hanson" is given as the creator for some of them. There were only three of us in the party-Joe White (who did nothing on the trip), John P., and myself. I recall that Harrington and I took the photographs. So who is this John Hanson? The only other person we had much to do with on St. Paul Island was Father Baranoff, who talked Russian with Harrington most of the time. Has anyone seen the name "John Hanson" in Harrington's notes or correspondence? If so, could they drop me a note on this? I've been surprised to find that there's an enormous amount of Klallam (Straits Salish) material in the JPH microfilm (Volume I, Reels 16 & 30), much more than Elaine Mills' guide seems to indicate. On these two reels there are over 2,000 pages of notes with Klallam data! And it's very good phonetically. Harrington collected these materials in 1942. He worked with some very old people, some of them almost legendary among the Klallam today. Recently someone loaned me the Winter 1992/93 issue of the magazine News from Native California, which contains an article by Leanne Hinton, "The House is Afire," about John Harrington. On the first page of the article is a sample of Harrington's handwritten Salinan notes. In this sample I was quite surprised to find that he had written about "Pacifico's mother." The Pacifico mentioned-Pacifico Gallego-was my great-grandfather! My mother, Elizabeth (Gallego) Porter, was a small girl when John Harrington visited her home in San Luis Obispo to talk to Pacifico. Unfortunately, none of the children were allowed to be present during these visits. During the early 20th century an Indian had a difficult time fitting into the mainstream of society. As a consequence, my grandmother tried to avoid any reference to the family's Indian heritage. Spanish or Indian was not spoken or taught to the children. Very little information about Pacifico or his son Pedro was ever passed down to the following generations. We have no photographs or written history about Pacifico's side of the family. I would be very grateful if scholars who know what else Harrington wrote about Pacifico would contact me and let me know what additional information there is concerning him. Any information that can be provided will be genuinely appreciated. The enclosed photograph came to me via Bob Edberg, ca. 1980. It's from 1902. J. P. Harrington is Editor-in-Chief of his high school annual, El Meteor. His portrait is framed with opium poppies. Seaburg, William R. Collecting Culture: the Practice and Ideology of Salvage Ethnography in Western Oregon, 1877-1942. Ph.D. dissertation, Univ. of Washington, 1994. 325 pp. [Seaburg focuses on the similarities and differences in the fieldwork and publications of four "memory culture" anthropologists who worked at the Siletz Reservation: J. Owen Dorsey, Philip Drucker, Elizabeth D. Jacobs, and John P. Harrington. Each interviewed the same consultant-Coquelle Thompson (d. 1946)-and S. also looks closely at his life and his active role in the construction of anthropological knowledge about "Upper Coquille Athabaskan" and reservation culture.] See Dissertation Abstracts International 55(11), p. 3554-A.